Okay, okay, so technically we shouldn’t be releasing our top-secret tricks of the trade on this one. Or so says everyone else in the industry. But, why? The team here at Knox Carpets prides itself on getting to know our customers. We’re not just talking about your needs, and your property. We’re talking about your likes and dislikes, and completely transparent communication. Completely transparent communication benefits both parties. It ensures that we’re hearing exactly what you need and how, and it ensures that you’re comfortable with us- our team members and our process. First we’ll discuss your needs. Important disclaimer- your needs matter. They’re never weird, or too small or too big. We’re just happy that you’ve brought them to us. And believe us, we’ve probably seen weirder or smaller or bigger than yours. We’ll talk through what kind of schedule or timeline you’re working on, if this is work that needs to be completed in a hurry. If it is, and you’re working on a budget, then we’ll discuss the trade-offs between the work taking a little bit longer, or alternative materials that you can use. Next we’ll survey your space. We’ll want to come out and get exact measurements, wall-to-wall. We’ll need to take a look at the existing hardwood, bamboo or carpet in place and discuss the best way to remove it. We’ll always remove the existing flooring and can dispose of it if you’d like. You’re also welcome to keep it for a rainy day if you’d like. No judgements here. If we’re installing multiple styles, then we can talk about what the defining lines will look like, so that you can get a visual of the final product. This is a great time to show samples of different carpet so that you can look at them and feel them in person. While a picture may tell a thousand words, there’s nothing like the in-person experience. Once you’ve approved the material of choice, the magic really starts to happen. 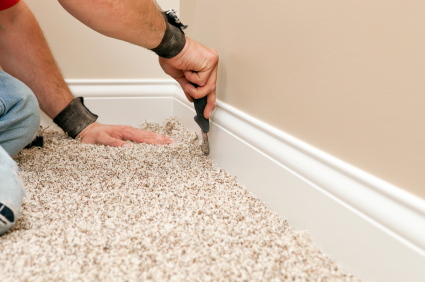 We’ll remove the original carpeting by cutting it into manageable strips and prying it from the strip’s corner. We repeat this process until the underfloor is visible. Next we ensure that this area is totally clean and clear of any dust, debris, debris, etc. We want a clean slate to work with. We install the carpet in strips as well, fastening the underside to the bottom of each wall in the space. There is never any hardware for you to trip over or for your pets to play with. When our job is complete, you’re looking at one seamless vast mass of luxurious carpet and our job (for the most part) is complete.